You might recall that late last year I mentioned that Matty took an interest in running and completed two 5Ks in November with me. This past summer, he became even more interested in running, and is serious about his training. He joined me during many of my evening runs, or “races”, as he calls them. He is overly concerned with things like wearing the right shoes, using proper form, stretching enough, and of course improving his time. Since running season is just around the corner, I thought I’d create a Runner’s Race Pack for him to start the season off right. A lightweight sports cap, perfect for keeping the sun out of his eyes when we’re out running. Fresh fruit: bananas, grapes or strawberries are his favorites. 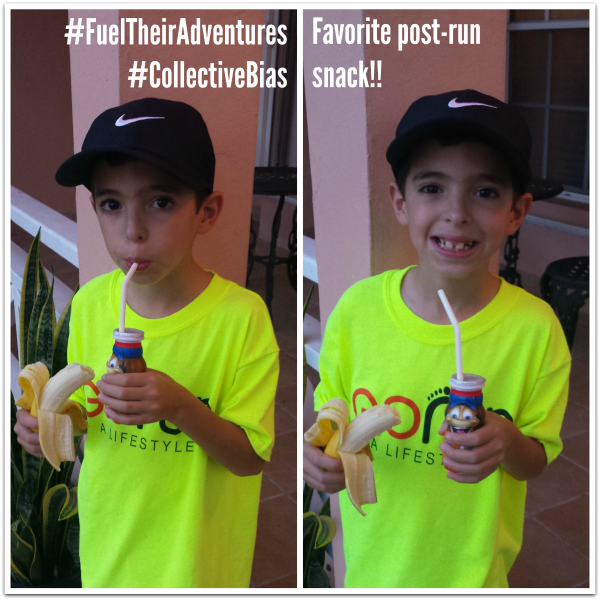 A serving of fruit and a bottle of Dannon® Danimals® Smoothies make the perfect combination to fuel Matty’s running adventures, either before or after our runs. Dannon® Danimals® provides “Only the Good Stuff®”, with no high fructose corn syrup or artificial flavors or colors, and provides a good source of calcium and vitamin D.
Dannon® Danimals® are the perfect on-the-go option that helps fuel kids’ adventures – at school, after school, during practice or homework, or to start the day! Our fridge is almost always stocked with Dannon® Danimals® Smoothies, at just the right level where Matty can grab them with ease. I say almost because sometimes I can’t buy them fast enough! I bought two 12-packs at Walmart a few days ago, let’s see how long they last. He’ll drink a pack in a day if I let him! If you’ve seen Dannon® Danimals® at the store recently, you’ve probably noticed the Fuel Up to Play 60 special packaging. Find the “Golden Bongo” bottle (located in specially marked packages) and you can win a Play60 Field Day for your school with NFL pros! Check out the Fuel Up to Play site for rules and ways to win. Remember that second bottle of Dannon® Danimals® I mentioned earlier? That one was reserved for later on in the evening: it’s Matty’s favorite bedtime snack! Dannon® Danimals® Smoothies 12-packs come in Strawberry; Strawberry/Strawberry Kiwi; Watermelon/Strawberry Smoothies; Seasonal Smoothies; and Strawberry/Cotton Candy, which is only available for a limited time. Which is your family’s favorite? This entry was posted in Feed Me, Health & Wellness, Life with Boys. Bookmark the permalink. The Dannon Smoothies look like a fun kid food. A great reward after running.